Crimespree Magazine provides outstanding interviews, great short fiction, insights from authors and the hands down the best reviews available in the crime genre. Issue 40 is no exception. This time around, J.A. 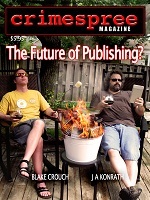 Konrath and Blake Crouch discuss the future of publishing. Jeremy Lynch catches up with Once Upon A Crime Bookstore owners Gary Schultz and Pat Frovarp, winners of the MWAs 2011 Raven Award. We get fiction from Gloria Alden, Steven Sidor and The Top Suspense Group. Plus there’s the usual suspects: Reed Farrel Coleman, Craig McDonald and Ayo Onatade. Of course, there is a heaping pile of book, DVD and comic reviews.